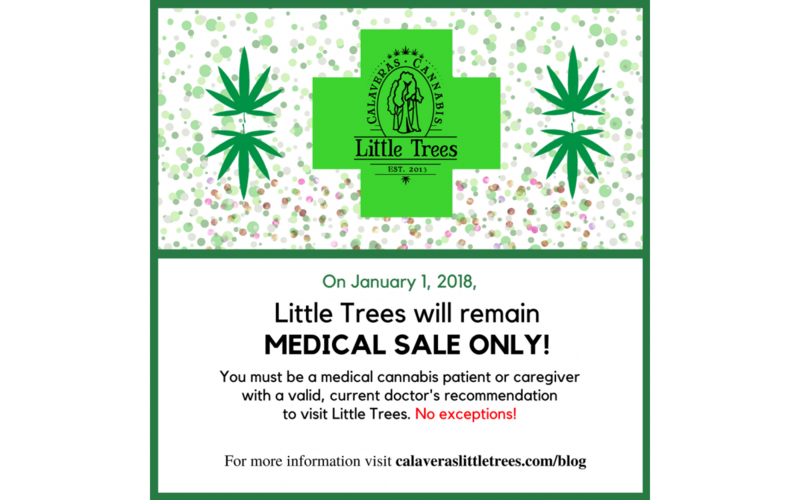 The Calaveras Board of Supervisors has stated that all Calaveras dispensaries must remain medical sale only. This means that you will continue to need a current Dr’s recommendation for cannabis to visit us! Also, beginning on January 1, 2018 ALL cannabis purchases (both medical and adult use) will be subject to a 15% excise tax, in addition to Calaveras Measure C (7%) and California Sales and Use tax (7.25%). Note: Patients holding a valid, STATE ISSUED card from the CA Department of Health are exempt from Sales and Use tax. Some of our prices will unfortunately have to increase because of the new excise tax. 🙁 But don’t worry, you’ll still have access to your our 5% loyalty program and your store credit will never expire! We are pretty excited to be here for this moment, even though we can’t fling those doors open on 1/1/18! Please contact your county Supervisor if you think they should change their mind about recreational sale in Calaveras County!